When Jaques Hamilton, AM '11, graduated from the School of Social Service Administration, there was no need to ask about future career plans. He was already founder and president of L.I.F.E., a nonprofit that is now providing resources and opportunities for more than 15,000 youth in Chicago, Memphis, and Houston. "I came to SSA with personal knowledge of what it meant to be in the at-risk community. My fieldwork placements at SSA put the tools in my toolbox that made it possible for me to start my own organization while I was still a second-year student," Hamilton says. Hamilton mentions that he learned a lot about client assessment and about how to keep records at Circle Family Healthcare Network, Aunt Martha's Youth Service, and Youth Guidance. But it was also important to see first-hand how to effectively create and implement resource linkage within the local community on behalf of clients. "Because my own upbringing could not provide the resources I needed, SSA really helped me out by extending my networking base. Both fieldwork instructors and classroom professors gave me navigational tools that I use every day. Now my goal is to help others bridge the gap between opportunities and resources for an intended population. There are a lot of resources out there. It's a question of being able to connect them with a vulnerable population," Hamilton says. He defines civic engagement as the process of getting out and then giving back. Although his responsibilities include finding donors and sponsors, other key ways he offers civic leaders to be involved include being a mentor, tutor, field trip chaperone, workshop facilitator, and guest speaker. He believes that it is flexibility in using situation-appropriate activities that allows all participants to establish rapport and form a strong bond. "Just as I found SSA to be a community that is productively diverse, L.I.F.E. 's emphasis on diversity provides what we consider to be innovative peer mentoring. L.I.F.E. offers a village of services through postsecondary education—either college or vocational training—with volunteers who are students and young professionals. We also welcome those who work other jobs, such as firefighters and electricians, to be mentors. We want to form relationships that are not about promoting the status quo. Whatever the client has been in to begin with, we want to teach each individual by example how to play the game of life and to transition out of their negative situation," Hamilton says. Hamilton goes on to say that this is what happened for him at SSA, where he served as class president from 2010 to 2011. He describes his coursework as giving him both lenses—from the inside out and from the outside in—through being able to conduct research and write case notes on the effectiveness of various mentoring and therapy programs. He also learned how to write fundraising reports that show numbers in a way that is understandable and motivational. "For myself as well as those I continue to serve, what makes change sustainable is providing the means to achieve a transition that is appropriate and productive. Now I'm in a position to offer outreach volunteer opportunities to join the movement through L.I.F.E. Professors at SSA challenged me to move to another level. 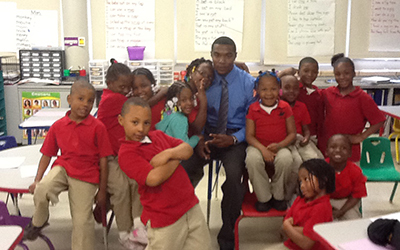 But first they encouraged me to explain to my classmates what it was like to grow up in a low-income situation. They made it possible for me to think about my situation and relate it to the topics we were studying in class. SSA helped me a lot to understand the dynamics of life," Hamilton says. L.I.F.E. offers a wonderful opportunity to facilitate either an on-going mentoring program or a workshop of your profession or academic major at Kenwood High School. This is a one time commitment to this after-school program that runs through the end of this academic year. If you are interested, the available days are Monday-Thursday from 3-6 pm. If you wish to mentor, please request an hour each week; if you want to facilitate a workshop, please send us a date and time. The workshop only needs to be 30 minutes. Please contact Jaques Hamilton at L.I.F.E.